To be honest, it’s sort of annoying how little credit people give Vizio. TVs and home audio gear used to cost a fortune, but companies like Vizio swooped in and offered high-quality devices at a fraction of what big brands were charging at the time. The entire market was forced to adjust, and everything is more affordable now as a result. What you might not realize, however, is that Vizio still offers fantastic TVs and top-notch home audio products, and they’re still more affordable than anything you’ll find from top brands like Samsung and Sony. 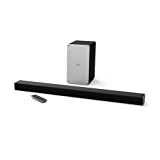 The VIZIO SB3621n-E8M 36″ 2.1 Sound Bar System is a fantastic example, offering killer sound and a gorgeous aluminum design for way less than you’ll spend on a big-brand sound bar. It’s discounted right now on Amazon, so definitely check it out.